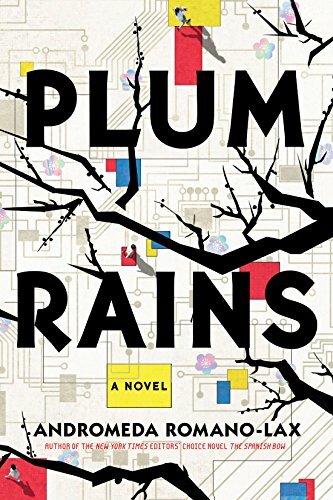 Andromeda Romano-Lax surprises and delights readers in her new novel, Plum Rains. The book follows the lives of a trio of unusual characters: Angelica, a Filipina nurse, living in Japan on a precarious work visa; Sayoko, an elderly Japanese woman with a secret past; and Hiro, a new kind of Artificial Intelligence —a prototype robot who is as real as any of the human characters in the book. The three are brought together by necessity but they eventually form a strong bond and end up reliant on each other in a way that makes the reader examine his or her own life. From the very start of the book, Romano-Lax seems to be talking about something bigger than the story of her characters. The novel takes place a couple of decades in the future—a future that is not too far off, but one that is radically different from today. This is a future where the Internet of Things and our computer-assisted environments shape the overwhelming majority of everyday life. It’s also a future where the climate has altered our world-view. This is a future in which the United States decimated Alaska to avoid a bird-flu pandemic, resulting in a toxic zone where only a few mining companies are allowed to exist. It’s also a future in which Japan has become a place so mysteriously polluted that it’s nearly impossible for women to become pregnant there. This sense of subtle fear permeates almost the entire book, giving it a sense of suspense that you don’t explicitly realize until you put the book down and notice your heart is racing and you won’t possibly be able to sleep for a week. This sense of suspense is accelerated as we learn about Angelica’s struggles to remain in Japan, and why she’s there—the hopeless of life in the Philippines and the outrageous debts that she and her brother have accrued to get out of their home country. At the same time we begin to learn more about Sayoko and her youth, growing up in the far off reaches of the Japanese Empire. At first, Sayoko’s story seems to be a calm, almost bucolic tale. But that quickly changes as her struggles become real and we learn about the journey that ultimately takes her to post-war Japan where she eventually becomes so Japanese that she passes as a native. The interloper in all of this is Hiro, an experimental robot, who learns in much the same way that humans do, only much faster. Each woman takes a very different approach to the robot. Sayoko finds a confidante and a friend almost immediately. Angelica resents the robot and struggles to come to terms with his existence. She fears he is there to take her job. But eventually the two get to know each other and arrive at a mutual peace. The end is unexpected and will keep the reader thinking about the role of technology in our lives, long after you put the book down. As a reader, we can take what we like out of the books we read, but Romano-Lax seems to be telling us about our own power as individuals. She paints a picture of a believably-close reality and then shows us how we do still have the power to change that reality. Ralph Josiah Bardsley's debut novel, Brothers, won a 2015 Foreword Indie Book Award Bronze Medal for LGBT Fiction and was a Lambda Literary Finalist. His most recent book is A Careful Heart.